Tag line: "The Day The Earth Was Turned Into A Cemetery!" Saul Bass, an artist known primarily for his graphic designs (he created the opening title sequence for several movies, including Otto Preminger’s The Man With the Golden Arm and Alfred Hitchcock’s Vertigo), directed only one feature film during his Hollywood career: the 1974 sci-fi / horror flick, Phase IV, a movie that shows what might happen if ants decide to take over the world. Two researchers, biologist Dr. Ernest Hubbs (Nigel Davenport) and communications expert James Lesko (Michael Murphy), are sent to the Arizona desert to investigate reports that various species of ants are becoming aggressive, and attacking the local population. Believed the result of a cosmic blast of radiation, which, by all accounts, has also increased their intelligence, the ants appear to be bonding together, working as one to lay waste to the entire area. When Dr. Hubbs provokes the ants by destroying the dirt pillars they call home, it leads to a battle of wills between man and insect, with the ants continually gaining the upper hand. 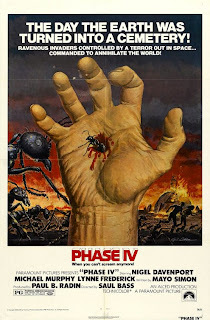 Stylistically speaking, Phase IV is a very unusual motion picture, a sci-fi/horror film with a decidedly art-house feel (think Kubrick’s 2001 A Space Odyssey combined with Kingdom of the Spiders). The movie opens with a 7-minute sequence, shot by entomologist Ken Middleham, in which we see dozens of ants in extreme close-up. From there, we’re treated to such natural splendor as a panoramic view of the desert, a beautiful sunrise, and various other shots meticulously designed by Bass, who was clearly attempting to flex his creative muscles. Yet, despite all the artistry on display, Phase IV is ultimately a film about killer bugs, and provides a few glimpses of the homicidal insects in action. Shortly after the arrival of the scientists, an elderly couple (played by Alan Gifford and Helen Horton) are forced to shoot a horse belonging to their granddaughter, Kendra (Lynne Frederick), when the animal is attacked by thousands of ants. The family then flees their home when it becomes infested with the deadly insects, only to find their truck is also overrun. There’s even a fairly disgusting scene where several ants crawl out of a hole they’ve burrowed into a dead man’s hand! While many viewers will undoubtedly be turned off by the film's slow pace (the two main characters spend a lot of time discussing theories and inputting data into the computers at their research facility), I found Phase IV to be a fascinating motion picture, a wholly original movie that tells its story of killer ants in as artistic a manner as possible. A great review and agreed, it's a very good film.